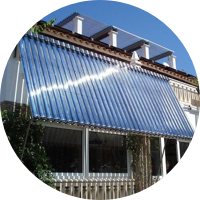 Solar Heat Tubes WES Solar Heat Tubes are simple and easy to install and maintain. These heat tubes are a “must have” for industries such as hotels, restaurants and large private and public office facilities. The cost saving using our heat tube systems are very substantial and we encourage you to request a Quote and comparative analysis from our renewable energy experts.